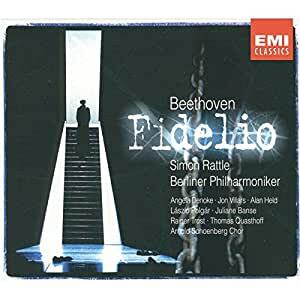 The Rattle Fidelio is outstanding from an overall and an orchestral standpoint. Based on a new Barenreiter performing edition (although I'm not sure I could tell what differences are notational and what are performance-based), Sir Simon presents Beethoven's musical structure in an incredibly moving and dramatic way, and the Berlin Philharmonic shines. I find no fault with Sir Simon here. His grand pauses and tempi are unusual...but who says we have to hear this the same way all the time? The voices of Marzelline, Jaquino, Rocco, Pizarro, and Don Fernando (Quasthoff) are fine to excellent. The vocal leads, however, disappoint. Florestan (Villars) is clean but boring, unidiomatic, non-pathos-laden, and completely inadequate for the essential dramatic requirements of the role (Jon Vickers where are you?). Leonore (Denoke) is also less than optimal, especially in the "Abscheulicher!". With a better Florestan and a better Leonore this would have been a great recording. As it is, it is worth hearing. Whether you want to own it or not depends on how many Fidelios you want on your shelf. It's definitely not the one and only, and no recording of Fidelio that I know of even comes close to being that, but to the extent that singing matters (after all, this is an opera) there are better. but apparently, not for Sir Simon Rattle, who conceives no l'amorosa fiamma for Leonore Overture - he did not perform it here; it is especially strange, since he is a notorious Mahler conductor, and Gustav Mahler made it a rule to include Leonore Overture III in his interpretation of Fidelio. The absence of this overture is already a big minus, as it deprives a listener from more musical pleasure. Otherwise, the recording is good, with excellent voices - Angela Denoke (Leonore) is exceptional, with Thomas Quasthoff is a convincing Don Fernando, and I particularly wanted to hear Alan Held - I saw and heard him once in Der fliegende Holländer as Der Holländer (The Dutchman) in Washington DC; he was PHENOMENAL. And here he was a great Don Pizarro, although sounding lighter than some deeper, more basso voices. Overall, it is a good, but not a particularly outstanding recording; I'd give it four stars if it had the Leonore Overture, but still it is not as particular as Bernstein's or a timeless classic as Furtwangler's Fidelio. I admire Simon Rattle and was thrilled when he beat out Barenboim for leadership of the Berlin Phil. But except on rare occasoins, Rattle has never been a strong advocate of Beethoven--he went 20 years of prolific recording activity without making any Beethoven CDs, just as he recorded no Mozart or Brahms symphonies and precious little Haydn. Now he finds himself in the wrong territory fot that kind of holdout. Playing catch-up hasn't been easy. This live Fidelio is a case in point. It would be automatically disqualified (except to slavishly devoted British critics) by the second-rate singing in every lead role, but especially the light-voiced and totally unidiomatic Leonora and Florestan. But even with better singers, Rattle can't find a style for Beethoven, other than to fuss over the line and push the pace. This great masterpiece demands a lot more--at this point Rattle doesn't have it to give. While generally agreeing with Mr. R. Levine's evaluation, I take strong exception to his comment on Angela Denoke. She is a wonderful heroic soprano, perfect for the role. Her passionate, emotionally charged voice blends beautifully in the ensembles and shines in her great aria "Abscheulicher!" in the first act. In any case how could she have been chosen otherwise for the Salzburg Easter Festival by Sir Simon Rattle ? This is a great new set, conducted with inspiration and wonderfully recorded with rich well rounded sound. Highly recommended!